Frank, Fred, Fritz, and Gabe act a bit silly (what's new?) before the conclusion of the St. Patty's Bash on March 24, 2007 in Camden, NY. Fritz and Gabe ham it up for the camera as Rick is all smiles at the St. Patty's Bash on March 24th. Fritz plays the button-box accordion while Rick keeps the beat during the 3rd set on March 24, 2007. Fred and Fritz with their Excelsiors in Camden, NY at the St. Patty's Bash on March 24, 2007. Fritz and Frank smile for the camera, while Gabe strikes a serious pose with his Parker guitar in Camden, NY at the St. Patty's Bash. 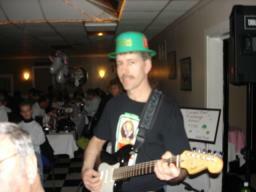 Fred poses with FPB Fan Club Members, Mabel (L) and Helen (C) on March 24th at the St. Patty's Bash in Camden, NY. Rick and Fritz are pictured here in Camden, NY on March 24, 2007. 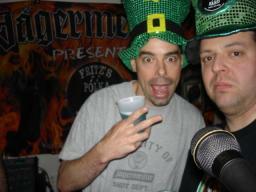 Frank and Rick model their St. Patty's hats on March 24th in Camden, NY. Frank with his Fender on March 24th in Camden, NY. Gabe (with his special St. Patty's hat) poses with his Parker bass during FPB's gig at the St. Patty's Bash on March 24th. 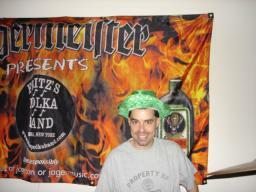 Rick poses in front of the FPB/Jagermeister banner on March 24th, while sporting a St. Patty's hat and a special Jagermeister t-shirt. Gabe, Rick, and Fritz toast some special Jager punch with their friends, Cris and Debra, prior to their 1st set on March 24, 2007 in Camden, NY.